Now Enrolling for the 2019 – 2020 academic year! As a K¹² partner school, Albany Online ignites the minds of children like yours to bring learning and innate possibility alive. Together, we are helping area students in grades K-12 reach their personal potential. As a program within the GAPS district, it is fast and easy to transition to and from the Online program. Call 541-967-4607 for more information. 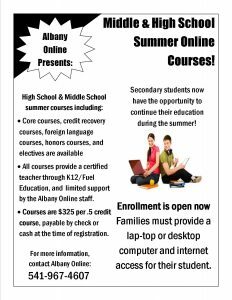 Families with 6th – 12th grade students, interested in purchasing an online course for the summer, please contact Albany Online’s office directly. You do not need to enroll through K12. You can reach us at 541-967-4607. We encourage you to join us for an information night hosted by our local Albany Online staff. Participants will learn more about the Albany Online program and may submit an enrollment packet for the 2019-2020 school year. Group sessions are held in mid/late August and in January. Watch this page for specific dates, or give us a call! We are happy to talk with you. All Information Night events will be held at the Greater Albany Public School district office, 718 Seventh Ave SW, Albany. Feel free to call us for directions or if you have questions: 541-967-4607. We are currently planning our field trips for 2019-2020. During the 2018 -2019 school year, we enjoyed; the pumpkin patch, a presentation by “Teddy Roosevelt”, Storybook Land, SafeHave Humane Society, The Albany Regional Museum, a sesson in relaxation through Yoga, and Discovery Days at OSU. All 6th grade students have the opportunity to participate in Outdoor School too! “Like” our Facebook Page: “Albany Online – Albany, OR” to see the latest events, details and updates. Select the video links below to hear program overviews from teachers, parents and students who are currently in the K12 program. **These links will open another page onto the www.k12.com web sites. Families are required to provide their own consistent, high-speed internet for their student(s).